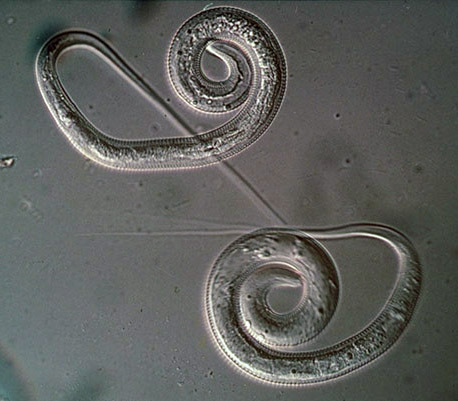 Dracunculiasis or guinea or Medina worm infection is caused by the tissue nematode Dracunculus medinensis. This worm has an indirect life cycle with small copepods as intermediate hosts. Adult worms live in the connective and subcutaneous tissues, particularly in the legs. Dracunculiasis has a high morbidity and causes economic loss by reducing the working capacities of affected individuals. Worldwide attempts to eradicate this disease have met with initial success: the number of infected people has decreased significantly! Humans get infected by drinking water containing water fleas or copepods (Cyclops spp.) infected with third-stage larvae (approx. 0.5 mm in length). Infective larvae penetrate the intestinal wall and migrate via lymphatics to connective tissues where they develop into adult worms.